The Horizontal Disabler button on the back of the X-Arcade™ disables the left and right Trackball movement when it is held. It is the blue wire. All trackballs will veer left when thrown forward, this is normal. This is because all trackballs sit on 3 guides, see pic. This may be more noticeable at first until you break it in some. If you are noticing erratic mouse presses or the trackball is causing other odd issues such as high CPU usage, please open the Tankstick where you will find several unused spare trackball cables (orange/white/brown) that aren't connected to anything. Be sure the rubber sleeves on the ends of the connectors are covering the connectors completely so that they aren't touching each other or anything else inside. You can also just tape these ends with electrical tape if to be sure if you prefer. Info on how to adjust the speed of the trackball here. Info on installing the trackball correctly here. If left/right movement is not working, be sure you are not pushing the horizontal disabler button (the button on the back) against something while playing. Try connecting to your PC with the other connection (PS/2 or USB). Ensure no specialty drivers are installed for another third-party mouse that may be interfering with the trackball. If possible, test movement on a different computer to make sure it's not a PC specific issue. If connecting via a USB Hub, try instead connecting directly to the USB port. With the X-Arcade™ Trackball connected to your PC, go to www.WindowsUpdate.com and download all updates for your hardware. The X-Arcade™ Trackball should be using a Samsung driver. If left/right movement is still not working, open the X-Arcade™ and remove one of the wires from the Horizontal Disabler's microswitch. If the direction works this way, the microswitch may be bad, try swapping it with another button to verify this. If the steps above did not fix the issue or up/down is not working, open the trackball housing (see Trackball Cleaning below for instructions) and check that the masking/reader wheels are firmly screwed onto the rollers, these black plastic wheels should not move independently of the metal rollers. Be sure that the 2 PCB boards are also properly seated in the slots in the housing for them. Check that all wires are firmly attached to the PCB boards. 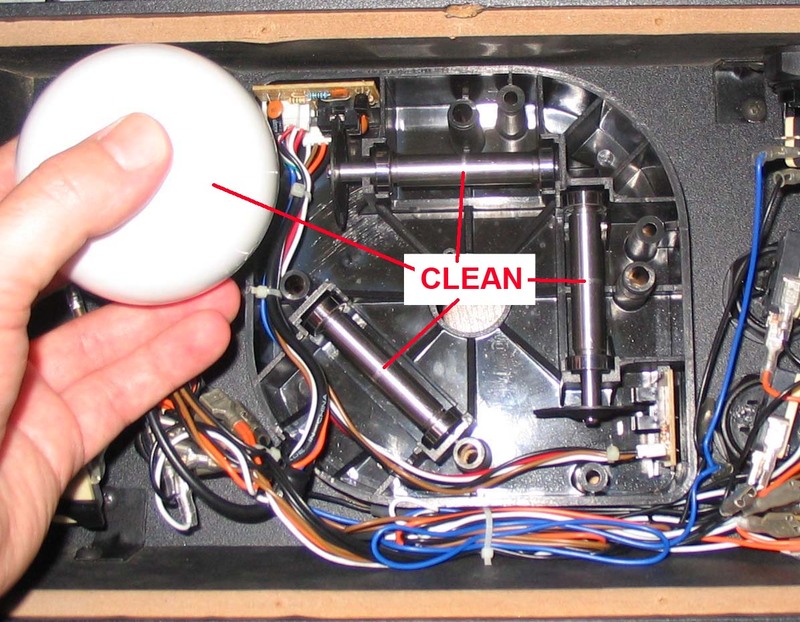 Input devices using mechanical mouse/trackball parts including the X-Arcade™ trackball may need to be opened and cleaned periodically. The frequency this needs to be done can be affected adversely by spilling liquids on the ball or using it with sticky/dirty fingers. When moving the trackball feels slow or rough, it’s time for a cleaning. Our trackball was made to be user serviceable just like at a real arcade, it does not void the Lifetime Warranty to open it. For best performance, only tighten the screws and bolts on the trackball housing just enough to hold it firmly. Over-tightening will inhibit performance. 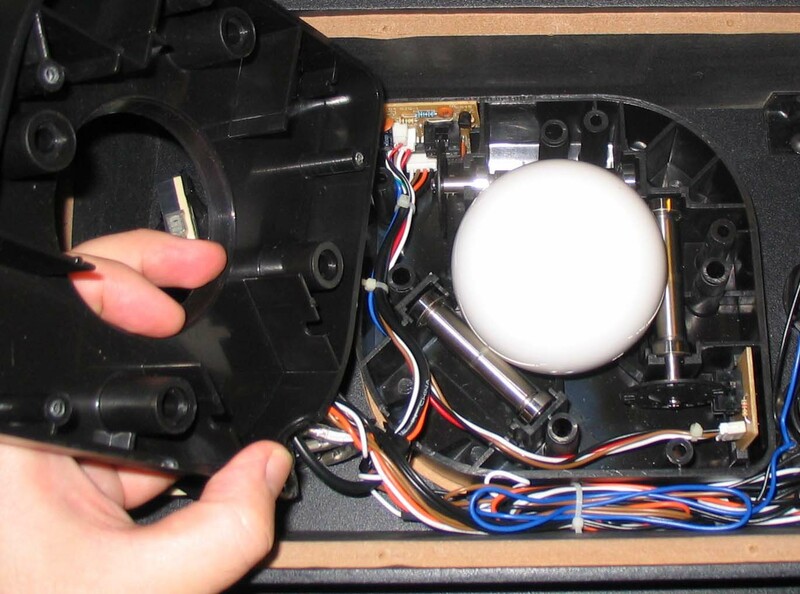 Do not open the plastic trackball housing upside-down (ball facing down) as this will cause all of the parts to fall out. It's not a huge deal if you do, but this will save you a 'D'OH!' moment. If your trackball is inside of an X-Arcade controller, first open The X-Arcade housing, instructions here. PIC: Remove the 4 bolts holding the plastic trackball housing into the wood casing. PIC: With a Phillips head screwdriver, remove the 4 screws holding the trackball plastic casing together. Do not attempt to open the trackball plastic housing in this step. PIC: Grab the bottom and top part of the plastic housing with both hands, holding them closed/together firmly, and turn it over so that the ball is facing up. PIC: Remove the top half (ball side) of the plastic housing. PIC: Remove the ball, and clean it with tap water and, if needed, dishwashing detergent. Dry it with a lint-free cloth. DO NOT get water near the electronics. PIC: Clean the rollers and idler (the 3 metal cylinders that the ball sits on) using a pre-moistened cleaning swab or cotton swab with rubbing alcohol. Allow surfaces to dry completely before reassembling. Reassemble following the above steps backward. 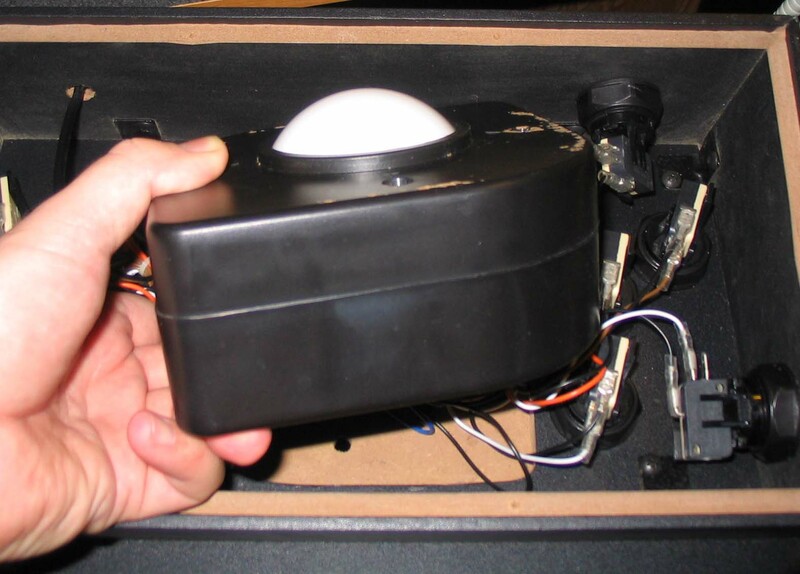 Your X-Arcade™ Trackball is cleaned, and ready for action! Want To Grease Up Your Bearings? Be VERY careful to not get any oil on the ROLLERS! There are two things you want in the trackball: the bearings should have as LITTLE friction as possible, but the ROLLERS (which contact the ball) should have as MUCH friction as possible. Any trace of oil will ruin that...Atari suggested 3in1 Oil on their trackball machine and the formula consists of pale spindle oil with a small amount of corrosion inhibitor and citronella oil (which gives the product its distinctive sharp odor).